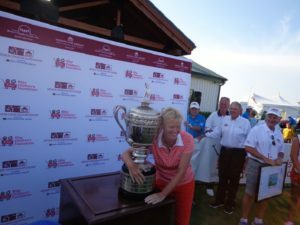 TRISH JOHNSON Hugs the Sr. LPGA Championship Trophy at the Pete Dye Golf Course at the French Lick Resort, her title defense begins today back in French Lick. The Schaumburg Golf Club now has it’s simulators open for fall and winter golf, so If this weeks cool spell has you wanting to play or practice inside, visit the Schaumburg Golf Club on Roselle Road, just minutes from the Woodfield Mall. Play Le Golf National home of the 2018 Ryder Cup, or Whistling Straits home of the 2020 Ryder Cup. 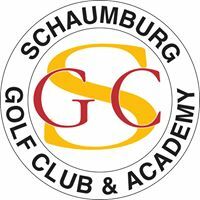 For more details go online and see Schaumburggolf.com or call the club at (847)-885-9000. 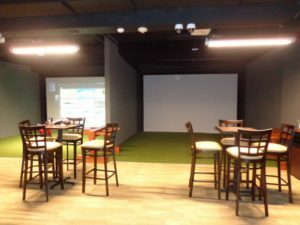 SENIOR WOMEN’S GOLF IS BACK with another major. 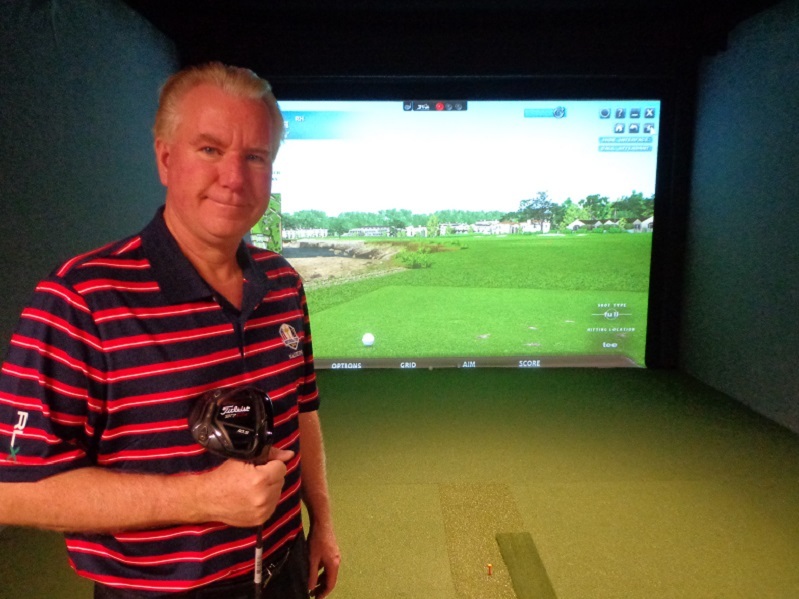 No the majors on this tour did not end with the play at the Chicago Golf Club back in July. Trish Johnson who took third place at Chicago Golf, is back at the French Lick Resort where she has two straight wins on her resume. She won the inaugural Sr. LPGA Women’s Championship here on the Pete Dye Course in 2017, and won the Legends Tour event here the year before that. Just in case you were wondering, yes, Johnson loves the Pete Dye Course, here at the French Lick Resort. Johnson who hails from England, knows it will get tougher this time around to pull off a three-peat on the Dye Course this week. Fellow England native Laura Davies who won the U.S. Senior Women’s Open by a whopping 10 shots, is here and ready to sweep both majors. Juli Inkster, and Danielle Ammacapne second and fourth in Chicago three months ago are lurking as well. What French Lick won’t be this week is, as hot as it was in July, where the thermometer hit over 90 on a few days. It won’t get much over 60 here this week in Southern Indiana. The terrain on the Dye Course with it’s rolling hills and some uphill shots won’t play easy this week, that old concept of “use more club it’s uphill” will come into play and the fact that the Sr. Women’s Championship is a 45 years of age and up championship, might offer some of the 40-somethings a chance to be real competitive in cooler and windy conditions. Click here to hear the interview with defending champion Trish Johnson and our BIG 3 partner Len Ziehm, who’s stories on this weeks championship are running today on, The Morning Read, the Arlington Heights Daily Herald, and on LenZiehmongolf.com. Golfers on Golf will be at the French Lick Resort for all three rounds. So stay clicked in.